When you hear “healthier school lunches,” you probably don’t think pizza and ice cream, but Blue Bell Creameries and Smart Mouth Pizza want you to think again. 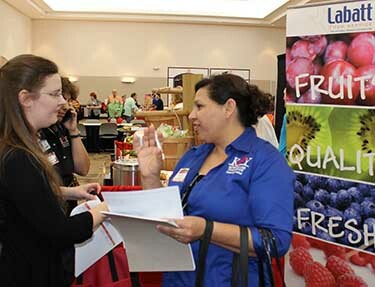 These innovative companies, who along with about 65 other vendors attended the Choice Partners Child Nutrition Food Spectacular in October, have products that meet the new USDA regulations that have been rolling out since the Healthy, Hunger-Free Kids’ Act was passed in 2010. Child nutrition staff from about 30 school districts and more than 150 students got to taste-test and grade the new, healthier options at the event, which was designed to help nutrition directors plan for the 2015-16 school year. When the new USDA guidelines were announced, Blue Bell added to their line of products designed specifically for schools. These included frozen juice bars, low-fat ice cream that satisfies dietary fiber and sugar requirements, and other items portioned into the correct serving sizes. "Blue Bell has a long history of providing healthy ice cream and frozen snacks as part of our school program," said Rob Hungate, Blue Bell Creameries, "so it was no surprise that many products in our current lineup already met the new Smart Snack guidelines. Blue Bell is not the only company working to make popular foods fit under the new guidelines. 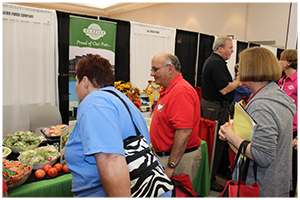 Exhibitors at the Child Nutrition Food Spectacular included other vendors that have contracts through Choice Partners, including Borden Dairy, Kurz & Co. (The “Good Bread” Company), Smart Mouth Pizza, and grocery suppliers Labatt Food Service and Glazier Foods Company. Smart Mouth Pizza has developed a fresh-baked, personal pan pizzeria style pizza, which uses whole-grain in their rising dough, low-sodium cheese and premium toppings. The pizza meets the nutrition requirements so it is a USDA reimbursable item. "Our program promotes brand appeal that the kids talk about. Smart Mouth Pizza has pioneered a program that helps create a food court feel for today’s kids, who are more accustomed to eating at a mall food court than the cafeterias of old. This in turn is an effective way to increase participation and profits in any school cafeteria,” said Jamie Cerutti, Smart Mouth Pizza’s profit and participation consultant. Smart Mouth Foods’ uses a simple “satisfaction guaranteed” approach with no upfront cost. New packaging and new ingredients are a few of the challenges facing schools under the USDA’s changes. Choice Partners members and vendors are taking them in stride. David Bienvenu, nutrition services director at Channelview ISD, said they order all their groceries, through Glazier Foods Company, which has been quick to resolve issues for them. From products that did not meet the guidelines to items that the children did not like, Glazier has helped find substitutes, according to Bienvenu. Bienvenu characterized the Glazier Food Company delivery drivers as “extremely dependable,” which is important when relying on a weekly delivery. Channelview ISD orders all the regular staples from Glazier Foods, such as pre-cooked foods like chicken fried steaks, canned fruits and vegetables, as well as supplies such as trays and cutlery. Channelview ISD uses many other Choice Partners cooperative contracts, such as Brothers Produce for fresh produce, Borden for dairy products, Kurz for bread, Blue Bell for ice cream, Auto Chlor for chemicals and others. Bienvenu said they have worked with Glazier Foods staff for more than 10 years and have developed a great working relationship. Glazier Foods Company is a broad-line food service distributor with two distribution centers, located in Houston and Dallas. Geographic coverage extends into seven states, with Glazier serving a broad customer base including restaurants, both local independent operators and regional chains. Service to the education segment is primarily focused within the Texas border. Glazier distributes a wide variety of products including meat, dairy, fresh produce and grocery items, plus disposable items such as cutlery, packaging and small wares. “We are able to serve our customers by offering a wide variety of choices from each of the product categories,” said Marc Mosley, education sales manager at Glazier. The company was recently purchased by Gordon Food Service. Integration was postponed until June 2015 to ensure there are no disruptions during the 2014-15 school year. Food contracts are one of Choice Partners’ specialties. The cooperative provides contracts for commodity-processed food products, such as USDA-approved meat, poultry, egg, cheese, peanut butter and fruit. In addition, the co-op procures contracts for food items such as bread, grocery products, produce, frozen and chilled beverages, plus food equipment and supplies. When districts use the cooperative contracts, they maximize their resources while saving time on the procurement process. For more information, go to www.choicepartners.org/food.